Brent Council’s Standing Advisory Council for Religious Education (SACRE) has been awarded first place in this year’s annual Inclusivity Award, which seeks to reward those working hardest in education at promoting the growth of inclusion, cohesion and mutual understanding between those of different religions and beliefs. Aspects of the SACRE’s work that drew praise from judges included its innovative approach to Collective Worship. The SACRE encourages its maintained local schools to give careful consideration to the religious affiliations of its students and their families, and is open to its schools applying for a determination that permits all the Collective Worship they provide to draw on material and practice that holds special meaning from different religions and non-religious views. The SACRE also earned praise for the contribution from some of its members to a local anti-bullying campaign and PREVENT teacher training, along with the diversity of its makeup. The committee includes as full members humanists and multiple representatives from the Jewish and Muslim faiths, to reflect the major denominations. To date the Inclusivity Award has only been open to schools. The 2017 Inclusivity Award judges decided to depart from this and only invite nominations from SACREs – the local authority convened committees that advise on matters related to RE and Collective Worship. 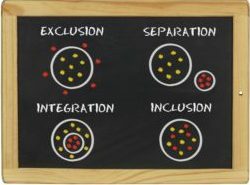 Although sometimes overlooked, as this year’s Award winners demonstrate, SACREs can play a very important role in helping local schools better promote integration and understanding between those of different beliefs. In third place is the City of Leicester SACRE. It won special praise for having built links with local schools that were not obliged to follow the local RE syllabus, including both academies and voluntary aided schools. The judges have also given a Special Commendation to the Suffolk SACRE for its ‘Teaching Controversial Issues Toolkit’. The toolkit simultaneously assists local schools in fulfilling their requirements to teach Fundamental British Values, advance the PREVENT strategy and further pupil’s Spiritual, Moral, Social and Cultural development. The judging panel extend their thanks to the many SACREs that submitted for the 2017 Award. Joining Rabbi Romain on the panel were former National Lead for Religious Education within Ofsted, Alan Brine; member of Parliament’s Joint Committee on National Security, Baroness Kishwer Falkner; Chief Executive Officer at the Religious Education Council of England and Wales, Rudolf Eliott Lockhart; and Anglican Priest and broadcaster, with interests in interfaith dialogue and conflict resolution, the Reverend Ruth Scott. The Accord Coalition will be disseminating in the Spring a short report highlighting many of the innovative and excellent practices that the judges identified.